TIA has in place an Executive board, the highest decision-making body, consisting of seven members: the respective heads of the five core organizations, one representative from the industry, one independent expert and the chairperson of Advisory Board. The Executive board is responsible for deliberating and deciding policies with regard to important management matters, while supervising TIA's operations. Meanwhile, the Advisory board, consisting mainly of members from industries, is responsible for making coordination with industries, which are the main users of TIA. To ensure smooth activities of the Executive board and the Advisory board, the Secretariat is jointly run by the five core organizations. 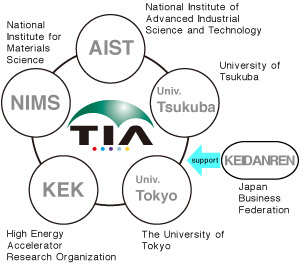 Currently under the secretariat, there are two permanent groups; the collaboration and planning team is in charge of TIA collaborative research program, "Kakehashi", and plans a TIA symposium, and the public relations team is in charge of exhibitions, TIA brouchers, and the WEB site. 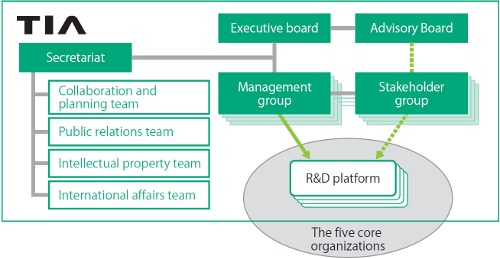 Besides the secretariat, a management group (MG) for each R&D platform is set up by TIA secretariat and researchers, which works for coordination of projects and for operation and management of facilities in the same platform. If required by a management group, a stakefolder group (SG) is set up for opinion exchange between users and TIA. © TIA. All Rights Reserved.